Home » Collection » William S. Burroughs serious, sad lover's eyes, afternoon light in window, cover of just-published Ace Paperback Junkie in shadow propped on couch-back above right shoulder. Japanese kite against old hot-water-flat wallpaper. Finishing compilation of Yage Letters and Queer manuscript he visioned first Inter-zone "Market" routines looking out South window at fire escapes & clotheslines criss-crossing Lower East Side apartment house courtyards--sailed to Tangier in December. New York, Fall 1953. 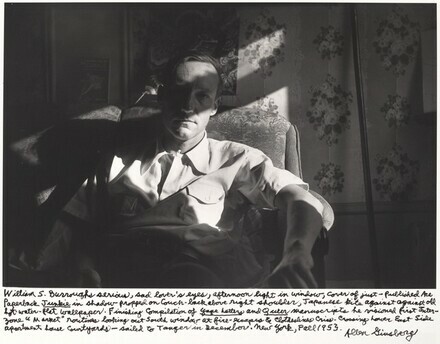 William S. Burroughs serious, sad lover's eyes, afternoon light in window, cover of just-published Ace Paperback Junkie in shadow propped on couch-back above right shoulder. Japanese kite against old hot-water-flat wallpaper. Finishing compilation of Yage Letters and Queer manuscript he visioned first Inter-zone "Market" routines looking out South window at fire escapes & clotheslines criss-crossing Lower East Side apartment house courtyards--sailed to Tangier in December. New York, Fall 1953.